Menu Plan for the Week, Using Fresh Cranberries, and Price Matching at Wal-Mart? 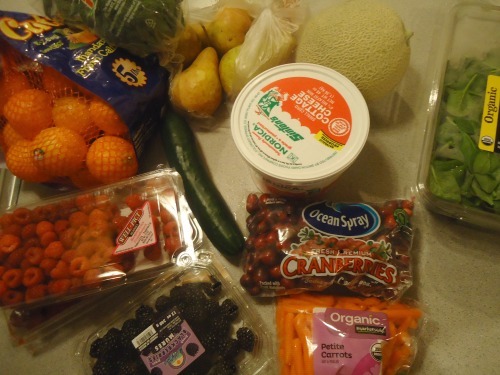 I bought a few groceries at the beginning of the week: broccoli, pears, cantaloupe, spinach, cottage cheese, cucumber, raspberries, clementines, blackberries, and petite carrots. All but the cottage cheese and half the cranberries are gone already. Time to go back to the store. This is a good “problem” to have. I am so thankful for all the delicious variety of produce available. By the way, that cantaloupe was the sweetest we’ve eaten in a long time. That’s amazing to me, seeing as it’s December. We devoured that melon. I came up with a fantastic Cranberry Almond Orange Bread recipe this weekend, which I’ll share with you during our 5th Annual Heavenly Homemakers Christmas Brunch. But regarding cranberries – I’m curious what you make with fresh cranberries? Leave a comment to let us know how you like to eat them and what you like to make with them. I’d love to hear your ideas. Oh! And we have an Aldi in Lincoln now, so I’ve heard I can start price-matching at Walmart since it’s 50ish miles away. I’m excited to learn more about how this will work. Any expert price matchers out there with tips for me?! I love Pioneer Woman’s Nantucket Cranberry Pie. it’s a very simple recipe and great to make with kids. 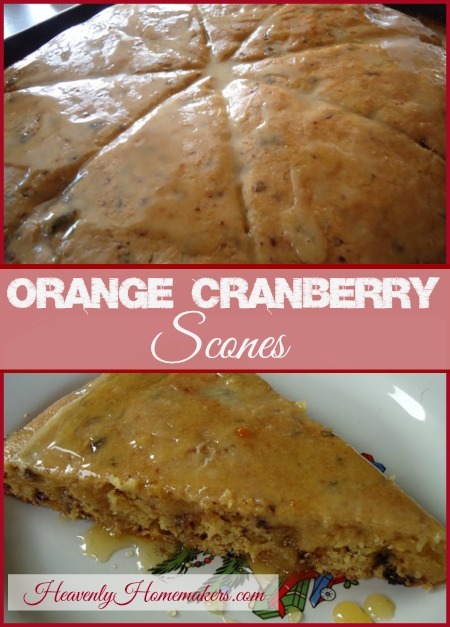 Yummy, those cranberry scones look so good! Now I wish i had bought some almonds yesterday. As for cranberries, I need more recipes for fresh ones, but we like to keep dried cranberries around to add to chicken salad. Price matching at Wal-Mart is super easy. I usually try to separate out my price matches and put them at the end. Then just let the cashier know which items you want to price match. Wal-Mart will also price match store brands with their Great Value Brand so long as the item is the same size. You can go to http://www.pricematcherz.com, click on Nebraska and select York and it will generate a list that includes Lincoln and Grand Island stores. I print this off and take it with me. I love dried cranberries in muffins, cookies, and chicken salad. I have only used fresh ones for cranberry sauce. I don’t care for the texture they seem to make in baked items. I never got into price matching until got the Wal-Mart app on my phone. I scan the receipt after shopping there and it compares all the ads and gives me the money in a gift card! Yep, same here! I never like taking the time to price match at our Walmart, in the past it has been a hassle. So, instead of doing that or go to different stores for the same products, I just scan my receipt after the shopping trip with Walmart’s Savings Catcher app. I compares prices to ALL of the stores in your area, including dollar stores and such. Then it deposits that money into your Walmart account that you can cash out for an e-gift card when you are ready. Easy peasy, and I know I am getting the lowest price with no extra time spent. In a very short amount of time, I have collected over $10 already. You can let the savings collect and roll over for up to a year. At the 1 year point, they will cash it out automatically to the e-gift card and email it to you. I make cranberry muffins with fresh cranberries. I’ve also put them in baked oatmeal along with chopped apples….sooo yummy! My 3 favorites are cranberry bars, cranberry apple crisp garnished with homemade vanilla ice cream, and cranberry upside down cake. American Express. After you make a purchase at Walmart, use the app to scan the QR code on your receipt. Walmart will check area ads (even ones you didn’t think to check) to find the best price. If the item was cheaper somewhere else, Walmart will refund you the difference. When you go to claim the refund, have it applied to your Bluebird card. AmEx will match the refund penny for penny so that a $1 refund becomes $2 on your Bluebird card for your next Walmart purchase. From 38 scanned receipts, I have had almost $10 refunded and then doubled to $20 on my Bluebird card. If I bought more name brands, that refund amount would be higher. Can you replace the honey with sugar for the Orange Cranberry Scones and if so how much? Thank You. Thank You! I am going to make them next weekend. I price match at Walmart all the time and never have an issue. I also use the app and get money back for prices I have missed. Keep in mind the app will not price match store brand items for you, which is why I continue to do them at checkout. I price match my Aldi’s ad at Walmart all the time. Recently the cashier pointed out that the fresh produce sales at Aldi’s only run through Saturday rather than Wed. to Wed. like everything else in the flyer (although she was kind enough to extend the price match to me anyway). I don’t know if this is true everywhere, but our grocery ads come in a Wednesday local paper so every chain runs on that cycle. I LOVE cranberries! I made Smitten Kitchen’s cranberry pie with pecan streusel topping for thanksgiving and it was out of this world! I also make an oatmeal cookie with fresh cranberries, dark and white chocolate chips. SO good! And thanks for bringing up the price match question. I am new to the stay-at-home mom world and we’re quickly discovering just how fast our budget can get away from us. I really need to get a better handle on our grocery budget, and hopefully doing some of this price matching will help. I did just discover how inexpensive walmart’s organic canned food is, which I’m grateful for! Cranberry Chutney. Makes amazing turkey sandwiches, but it really is the star on a plain old grilled cheese. Oh my gosh, so good! I found a great recipe online for a fresh cranberry relish. Grind equal parts cranberries and chopped apple in your food processor. Add a little pineapple juice, cinnamon (lots), nutmeg, ginger and honey. Chill before serving for more flavor. My sister-in-law makes a fresh cranberry relish that has a whole orange chopped up with the cranberries. Both are delicious!